I was in a car accident. Will I get reimbursed for my rental car? Your day was ruined because some inconsiderate and inattentive driver crashed into your vehicle. Your car now needs extensive repairs. You need transportation to work so while your car is being fixed. You need a rental. WILL YOU GET REIMBURSED FOR THE RENTAL CAR? If you have rental insurance under your own auto insurance policy, your insurance company will likely reimburse you on the rental bill, up to the maximum rental policy limit. Take a look at your declarations page to see what this is. You can also call your agent for assistance. If the accident was not your fault, it will not raise your insurance premiums if you go through your insurance. Your insurance will seek reimbursement from the other driver's insurance company for whatever your insurance company pays out. 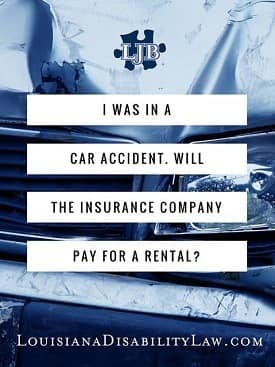 If you don't have rental insurance under your policy, but the other driver was at fault and he/she has liability insurance, then the other driver's insurance company should reimburse you on a rental car. Sometimes the insurance company does a "direct billing," meaning you don’t get charged and the bill goes straight to the insurance company. Other times (more likely), you will have to pay for the rental on your own credit card and then get reimbursed for the amount. You will only get reimbursed for a certain number of days of rental. The exact amount will depend on the extent of damage and how long it takes to repair, or until you receive the total loss check. You should only expect to get a rental for a similar type of vehicle as you have. For example, you will not be fully reimbursed for renting a luxury SUV when your car is economy, no frills, two-door coupe. 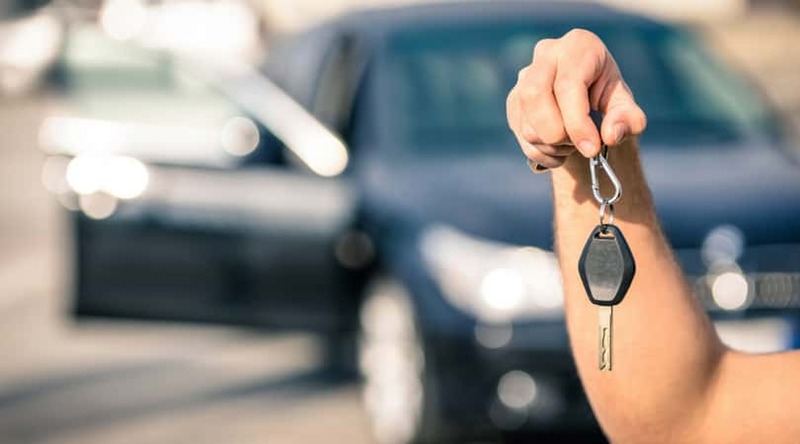 Even if you don't rent a car, you may be entitled to loss of use payments. This is a payment to compensate you for the days that you were unable to use your damaged vehicle while it was being repaired or while you were waiting for the total loss payment. When you get your car back from the repair shop, it is not worth the same as before it was damaged. The value has diminished due to the wreck and repairs. The at-fault driver’s insurance company should pay for that loss as well. 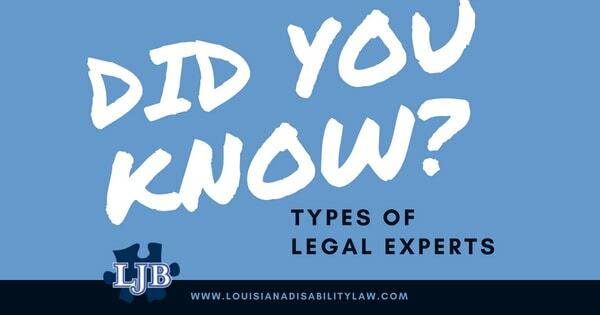 At Louisiana Disability Law, when our auto crash clients with disabling injuries are faced with these issues, we help them for no additional fee. If you need help following a serious crash, call Louisiana Disability Law at (985) 240-9773. Am I required to provide my financial information to my Long-Term Disability Insurer? Well – it depends. If you are a Louisiana doctor, dentist, small-business owner, accountant, lawyer, or other professional with an individual disability policy, you may. If you have group long-term disability coverage, your employer probably has already provided the information or minimal information may only be required. Your policy will include specific information about what you are required to provide. It is important for you to read your policy thoroughly if you have not already done so. The policy will have specific provisions concerning information that you are obligated to provide. Some big issues you may run into are discussed below. If you are a business owner or medical professional with an Individually Owned Disability Policy, the disability insurance company will likely require your financial documents is going to want to go through your finances in great detail. But what will they need? Your tax return only, or other financial statements like income statements, balance sheets, etc.? Simply put, your disability insurance benefits are usually based on your monthly income – so the disability insurer needs to figure that out to pay the benefits. They will not simply take your word. Disability Insurers often send broad requests for financial documents and tax returns for the past five years. In some cases, they may want to go back further, and some disability insurers are known for requesting financial audits in certain situations. Do You Have To Allow Your Financial Professionals to Speak to the Insurer? 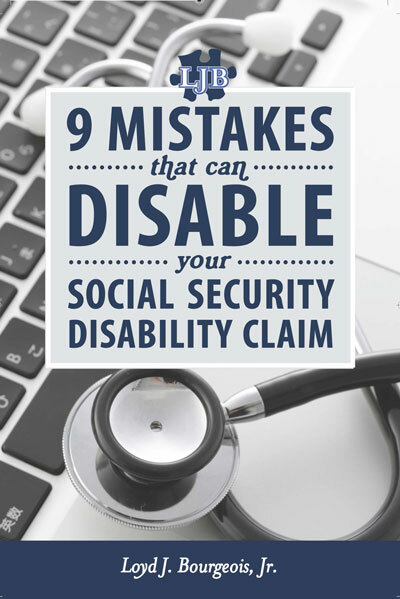 The disability insurer may also ask you to provide an authorization allowing them to obtain records from your accountant, bookkeeper, tax preparer, or other financial professional. Again, depending on your policy, this may or may not be necessary. Generally speaking, however, you are required to cooperate with the insurer’s investigation of your claim. You may be able to limit what is requested, but that will be policy specific. If you have questions about the types of financial records that your disability insurance company is entitled to receive under your policy, please call our office today at 985-240-9773. Should I consult an attorney before settling for the other driver's policy limit? You were injured in an auto crash. The injury was significant enough for you to miss some work and even required surgery. The at-fault driver's insurance company has offered you “policy limits.” You are wondering if you should just take the money or whether you need to talk to an attorney? After all, why split this much-needed money with an attorney if it is the policy's limit – right? Do you have actual, confirmed proof that the “’policy limit” offer is actually for policy limits? What proof do you need? Did the at-fault driver have any other insurance that may be able to pay for your damages? What other types of insurances may be available and how do you confirm it? Was the at-fault driver working at the time of the accident – even if in their own car? How do you even check this? Does the at-fault driver have any other assets that can pay for your damages aside and apart from the insurance? Are you able to go after them if you agree to this “policy limit” offer? How do you even investigate a person’s assets? Will this “policy limit” settlement affect your ability to recover under your own under-insured motorist coverage? Did you even know about that? How do you make that claim? Is someone else potentially responsible for your damages in excess of the “policy limits?” For example, what if both the driver and the actual car owner had separate insurance? Can you recover under both? How do you know? What about your medical expenses? How do you pay those if the “policy limits” are not enough to cover all the expenses? Can you negotiate those expenses? Why is this insurance company such in a hurry to pay you “policy limits?” Insurance companies are not in the business of just giving money away – they like to make a nice profit to pay for their television ads. What are you missing? You should make an informed decision about whether to accept the offer or not. Your decision should only be made after you know all of the facts. Make sure you have all of the facts. If you have suffered disabling injuries in a car wreck and are being pressured to just accept the “policy limits,” call the disabling injury lawyer at Louisiana Disability Law to help you get all of the facts before just accepting. Call today at (985) 240-9773. Is it important to have a Louisiana Personal Injury lawyer? Take a look around you – on television, in the newspaper, in politics - the insurance industry spends plenty of money to wage war against injured victims and their attorneys. The insurance companies have one agenda – pretend they are the good guys with their touching television commercials and propaganda so that they can get you to think they are helping you when you get hurt or injured, and thus keep their costs lower. Insurance companies promote legislation favorable to their profitability and do everything possible to paint the civil justice system as out of control and overrun with fraudulent claims. Look – the simple truth is there are some claimants and attorneys willing to file frivolous or fraudulent claims. These abusers have made it difficult for legitimate personal injury victims like you to find justice. I agree that these fraudsters must be held accountable. Their goal is to influence the minds and preconceptions of jurors against accident victims and their personal injury attorneys before they even hear the facts of a given case. 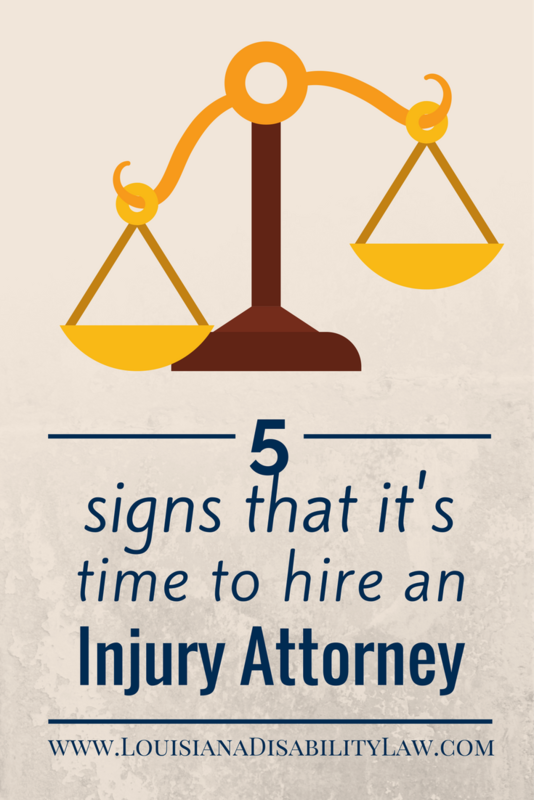 But what does this mean for you – a legitimate injury victim? You are the insurance company’s enemy! No matter how legitimate your claim, and no matter how badly you are injured, the insurance company’s goal is to pay you as little as possible. Period. You are merely a claim on its books, negatively affecting its bottom line, just like a fraudulent claim. The insurance industry has made you the jury’s enemy as well! No matter how legitimate your claim, and no matter how badly you are injured, the insurance industry’s propaganda campaign has convinced your friends, family, and neighbors that YOU are the reason insurance is so high. These people will make up your jury at the end of the day. And, you must prepare for this from the beginning of your case. You must convince the skeptical that you are seriously injured. You are the enemy. In my experience, insurance companies usually do not offer a fair settlement until you have an approaching actual trial date and prove to them that you are ready, willing and able to competently and effectively present your case at trial. But do not lose faith. Despite the insurance industry’s desire, legitimate cases are still won and juries still award just damages to seriously injured victims, like you. If you are looking for an attorney who can get it done and is not afraid of taking bold action to help you hold the insurance company accountable, Louisiana Disabling Injury and Louisiana personal injury attorney Loyd Bourgeois at Louisiana Disability Law can look at the specifics of your case to determine the grounds for your Louisiana personal injury lawsuit and help you file your claim. Contact us for a FREE NO OBLIGATION consultation – (985) 240-9773 or use our online contact form. Have you been seriously injured in a crash or maritime/industrial incident? Are you now dealing with a disabling injury? Did your crash/incident occur in Louisiana’s River Parishes (St. Charles Parish, St. John the Baptist Parish, St. James Parish)? You need to decide if you need a local injury attorney to help protect you and your family from the insurance industry. The simple truth is this – You need to hold the insurance company accountable. You decide – what is the best way for getting it done?! You have high medical bills or significant property damage directly related to the accident. Use your common sense and decide for yourself. Do you need an attorney? Peace of mind is important. Louisiana disabling injury attorney Loyd Bourgeois at Louisiana Disability Law can look at the specifics of your case to determine the grounds for your Louisiana personal injury lawsuit and help you file your claim. Contact us for a FREE NO OBLIGATION consultation – (985) 240-9773. How do I get to the Social Security office in New Orleans, LA for my hearing? The New Orleans Social Security hearing office is located at 1515 Poydras Street in New Orleans, Louisiana. Coming from the Westbank, cross the Greater New Orleans bridge, exit at O'Keefe Avenue. Stay on O'Keefe until you get to Poydras Street. It will be 4 red lights. Take a left onto Poydras Street. The building is at 1515 Poydras Street, just past Lasalle Street. To get to the parking garage, pass up the building and proceed to Freret Street. Take a right on Freret. Proceed up the ramp and press the button to get a parking ticket. Bring this ticket with you into the building. Do not leave it in your car. Once you have found a parking space, follow the signs to the elevators. Take the elevator to floor 1. Exit the elevator and cross the lobby to the second bank of elevators which go to floors 16-27. Take the elevator to floor 16. When you exit the elevator, you will see the Social Security Hearing Office. After your hearing, by the parking garage elevators, there will be a pay kiosk to pay for your parking. It accepts cash and credit cards. Taking your ticket and receipt with you. You will need them to exit the garage. Can I apply for Social Security if I was hurt in a car accident? The answer to this simple question is – it depends. It depends on your injuries. It depends on your symptoms. It depends on your treatment. If your disabling injuries keep you from being able to work for 12 or more months, you may be eligible for Social Security Disability benefits. If your injuries heal in less than 12 months, you are not eligible for Social Security Disability benefits in all likelihood. 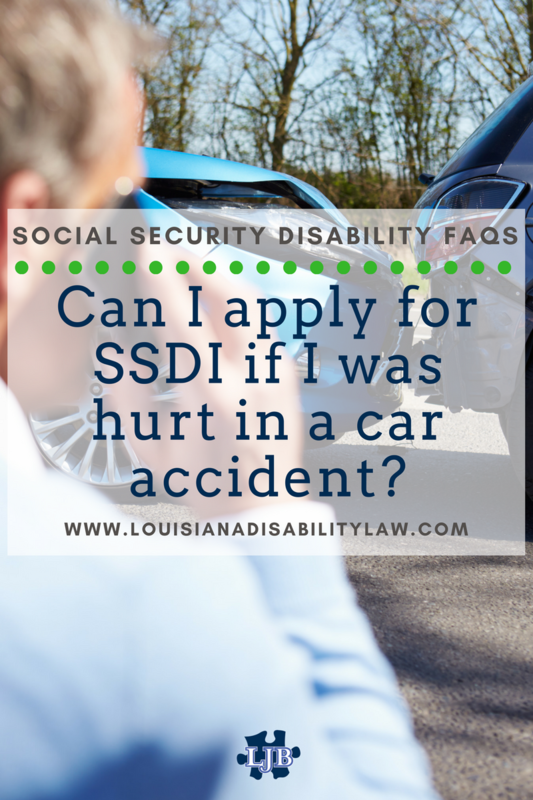 If you or someone you love suffered an injury in a car crash and have questions about Social Security Disability benefits, give us a call at Louisiana Disability Law. We have the experience to guide you through this difficult process of figuring out whether or not you may eligible for Social Security or other injury-related benefits. What types of expert witnesses testify during disabling injury cases? Most serious disabling injury cases come down to the witnesses. In any case, witnesses can be either fact witnesses or expert witnesses. A fact witness is someone who has personal knowledge of the specifics facts at issue. This may be someone who actually saw the accident – an eyewitness to the accident for example. It may be a medical doctor who treated you and testifies to the facts of your treatment. The other type of witness important to disabling personal injury cases is an expert witness. An expert witness is typically an individual who has specialized knowledge, training, or skill in a particular field, and who can provide some information relevant to your case. Expert witnesses are often hired by both sides in a case, and many times play a critical role in the outcome. There are many types of expert witnesses used in personal injury cases, - a few are discussed here. Car Accident Reconstructionist – This expert is usually a consultant for a collision analysis, reconstruction of the accident, injury reconstruction, and crashworthiness. An accident reconstructionist may also provide reports that focus on collision speed and vehicle safety. This type of expert witness may also testify about acceleration, right-of-way, braking, steering angles, and other issues related to vehicle crashes. Maintenance Specialist – This expert can be helpfu1 in 18-wheeler involved crashes. Maintenance specialists can show whether a trucking company did or did not perform required maintenance as claimed and whether the failure caused or contributed to the crash. DOT Regulations Specialist - Department of Transportation regulations are extensive. An expert can help your attorney determine if certain safety type products (helmets, tires, airbags, etc.) were properly tested prior to being put on the market. This expert can also help establish whether a trucking company’s drivers followed the safety rules and DOT regulations, and if not how that may have led to the accident. Cell Phone Records Specialist – In the information age and age of distracted driving, cell phone records are frequently used as evidence in crash cases. This expert can provide information used to demonstrate whether or not the other driver was likely using their mobile phone at the time of the crash. Vehicle Information Specialist - Data from the vehicle’s ECM (electronic control module) and EDR (event data recorder) or “black box” is important in some cases and it takes an expert who knows how to read and recover it. The information from this witness can be used to show various information regarding the vehicle’s actions immediately prior to an accident. This witness can help determine whether or not the driver’s actions or inactions may have contributed to the crash. They may also be able to show if the driver had exceeded the federal hours-of-service rules (too much time on the road) mandated by the FMCSA. Forensic Toxicologist - A forensic toxicologist provides clarification in disabling injury cases that involve an investigation into drug interactions, drunk driving, drugged driving, poisoning, and other cases that involve chemical ingestion or inhalation. Medical Doctors in General – Medical doctors can review the facts of the case in order to understand all the issues and objectively clarify any relevant medical questions. They may also assess the condition of the patient in order to determine the appropriate ongoing medical care and to assess the need for more specialized care in the future. Neurologist/Neurosurgeon - Neurology experts may provide testimony on a variety of topics relating to the brain, spinal cord, and nerves. Oftentimes, a neurologist may be needed to testify to the degree of your injury, your level of disability, and your treatment plan moving forward. The neurologist/neurosurgeon can also provide assistance with connecting the incident to your injury. Neuro-Psychologist – this is a medical doctor trained in both neurology and psychology, and this expert can be very important in cases with traumatic brain injuries (TBI) and mild traumatic brain injury cases. These cases often require years of rehabilitation or assistive care, and you need to take this into consideration before accepting any settlement with the insurance company or at fault party. Orthopedist/Orthopedic Surgeon – This is a doctor who specializes in bones and muscle/tendon/ligaments. An orthopedic surgeon can provide testimony regarding all aspects of your orthopedic injuries, including your level of disability and future outlook. They may provide reports related to surgery, arthroplasty, hip replacement, spinal injuries, and other issues related to the musculoskeletal system. Medical Examiner/Pathologist – A medical examiner, or coroner, is typically a pathologist and are responsible for evaluating the cause(s) of death. Testimony from this expert can be vital to a wrongful death case and help with determining responsibility. A pathologist conducts examinations and autopsies and can provide qualified and objective opinions on a victim’s medical condition and cause of death. Pain Management Specialist - Since some types of injuries can leave a victim with chronic pain and discomfort, the injured party can often help his/her case by using the testimony of a pain management specialist in order to demonstrate the full value of their related damages. This expert witness can testify about the extent of pain the victim suffers, how it affects his quality of life, as well as how much compensation will be needed to pay for future treatment. Life Care Planner - Life care planners are utilized to offer testimony on areas such as disability management, the cost of future care expenses, helping figure out the loss of income, and more. These skilled experts may also provide testimony in the areas of an individual’s earning capacity, reduced ability to perform a prior job, future earning capacity, the severity of the disability, life expectancy, and other related topics. Vocational Specialist - Vocational experts testify concerning the types of jobs available for an injured party given the residual functional capacity, and the effect of an injury on a person’s ability to perform any type of work on a sustained and consistent basis. VEs can also provide testimony regarding a person’s past work and any transferable skills. Their testimony can establish diminished earning capacity. Rehabilitation Specialist - Rehabilitation specialists focus on helping an injured party improve and restore functional ability following an injury – they could be a physical therapist/occupational therapist/speech therapist. They may also work with those who have permanent disabilities such as spinal cord injuries or a loss of limb. These experts can provide evidence concerning future rehabilitation needs and associated costs. Which specific experts will be necessary for your case is dependent on the specific facts of each case. Some cases require many; others require few. A skilled and experienced attorney familiar with disabling injuries can help guide your case by choosing the experts most appropriate for your injuries and incident. If you or someone you love has suffered a disabling injury requiring hospitalization or causing you to miss work, give us a call at 985-240-9773. We have the experience to guide you through this difficult process and advise you on both the injury and the disability aspects of your claim. How can I best present my case at my ALJ hearing? Having handled hearings for many New Orleans and other Louisiana Social Security disability claimants, I am often asked – how can I present my case most effectively at my Social Security disability hearing? Sometimes having friends, family or co-workers testify can help, but usually, the ALJ is more interested in your specific testimony. Plus, new regulations do not require ALJs to even comment on this witness testimony. As a Louisiana Social Security disability lawyer, I have developed and polished many effective techniques for winning benefits. If you or someone you love is fighting for Social Security disability benefits, give us a call at Louisiana Disability Law. We have the experience to guide you through this difficult process and present the best possible case for you before the Administrative Law Judge.